ON THIS PAGE: You will find information about the number of people who are diagnosed with NSCLC each year. You will also read general information on surviving the disease. Remember, survival rates depend on several factors. Use the menu to see other pages. NSCLC is the most common type of lung cancer, accounting for 84% of all lung cancer diagnoses. Statistics provided below for lung cancer include both small cell and NSCLC. This year, an estimated 228,150 adults (116,440 men and 111,710 women) in the United States will be diagnosed with lung cancer. Lung cancer makes up about 13% of all new cancer diagnoses. Black men are about 20% more likely to get lung cancer than white men. Black women are 10% less likely to get cancer when compared with white women. Lung cancer is the second most common cancer and the leading cause of cancer death for men and women. It is estimated that 142,670 (76,650 men and 66,020 women) deaths from this disease will occur this year. Due to a decrease in smoking, death rates have declined by 48% since 1990 in men and 23% in women since 2002. From 2012 to 2016, the death rates for men with lung cancer dropped by 4% each year. The death rates for women with lung cancer declined 3% per year. The 5-year survival rate tells you what percent of people live at least 5 years after the cancer is found. Percent means how many out of 100. The 5-year survival rate for all people with all types of lung cancer is 19%. The 5-year survival rate for men is 16%. The 5-year survival rate for women is 22%. The 5-year survival rate for NSCLC is 23%, compared to 6% for small cell lung cancer. However, it is important to note that survival rates depend on several factors, including the subtype of lung cancer, and the stage of disease. For people with localized NSCLC, which means the cancer has not spread outside of the lung, the overall 5-year survival rate is about 60%. For regional NSCLC, which means the cancer has spread outside of the lung to nearby areas, the 5-year survival rate is about 33%. If the cancer has spread to distant parts of the body, called metastatic lung cancer, the 5-year survival rate is 6%, but because of new effective therapies, this number is changing. Each year, tens of thousands of people are cured of NSCLC in the United States. And, some patients with advanced lung cancer can live many years after diagnosis. Sometimes patients who are told that their lung cancer is incurable live longer than many who are told that their lung cancer is curable. The important thing to remember is that lung cancer is treatable at any stage, and these treatments have been proven to help people with lung cancer live longer with better quality of life. Furthermore, it is important to remember that statistics on the survival rates for people with NSCLC are an estimate. The estimate comes from annual data based on the number of people with this cancer in the United States. Also, experts measure the survival statistics every 5 years. So the estimate may not show the results of better diagnosis or treatment available for less than 5 years. Talk with your doctor if you have any questions about this information. Learn more about understanding statistics. The next section in this guide is Medical Illustrations. It offers drawings of body parts often affected by NSCLC. Use the menu to choose a different section to read in this guide. ON THIS PAGE: You will find a basic drawing of the main body parts affected by NSCLC. Use the menu to see other pages. The lungs are located under the ribs, and above the liver, the adrenal gland, and the kidneys. 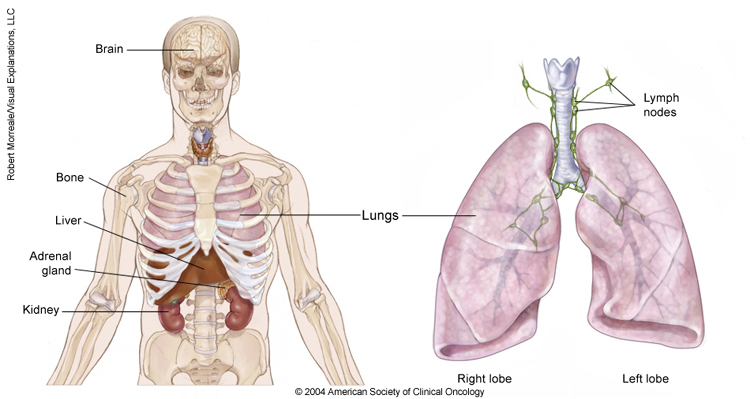 The lungs are made up of 2 lobes, a right lobe and left lobe. A hollow tube, the trachea, carries air to the lungs, branching throughout both lobes. Lymph nodes, tiny, bean-shaped organs, are located in the lungs, the center of the chest, and elsewhere in the body. Copyright 2004 American Society of Clinical Oncology. Robert Morreale/Visual Explanations, LLC. For medical illustrations showing the different stages of NSCLC, please visit the Stages section. The next section in this guide is Risk Factors and Prevention. It explains the factors that may increase the chance of developing NSCLC. Use the menu to choose a different section to read in this guide. Doctors use many tests to find, or diagnose, cancer. They also do tests to learn if cancer has spread to another part of the body from where it started. If this happens, it is called metastasis. For example, imaging tests can show if the cancer has spread, but they can never be used alone to diagnose NSCLC. Imaging tests show pictures of the inside of the body. Doctors may also do tests to learn which treatments could work best. Imaging scans are very important in the care of people with NSCLC. However, no test is perfect, and no scan can diagnose NSCLC. Only a biopsy can do that (see below). Chest x-ray and scan results must be combined with a person’s medical history, a physical examination, blood tests, and information from the biopsy to form a complete story about where the cancer began and if or where it has spread. CT scan. A CT scan produces images that allow doctors to see the size and location of a lung tumor and/or lung cancer metastases. A CT scan takes pictures of the inside of the body using x-rays taken from different angles. A computer combines these pictures into a detailed, 3-dimensional image that shows any abnormalities or tumors. A CT scan can be used to measure the tumor’s size. Sometimes, a special dye called a contrast medium is given before the scan to provide better detail on the image. This dye can be injected into a patient’s vein or given as a pill or liquid to swallow. Magnetic resonance imaging (MRI) scan. An MRI also produces images that allow doctors to see the location of a lung tumor and/or lung cancer metastases and measure the tumor’s size. An MRI uses magnetic fields, not x-rays, to produce detailed images of the body. A special dye called a contrast medium is given before the scan to create a clearer picture. This dye can be injected into a patient’s vein or given as a pill or liquid to swallow. MRI scanning does not work well to take pictures of parts of the body that are moving, like your lungs, which move with each breath you take. For that reason, MRI is rarely used to look at the lungs. However, it may be helpful to find lung cancer that has spread to the brain or bones. Bone scan. A bone scan uses a radioactive tracer to look at the inside of the bones. The tracer is injected into a patient’s vein. It collects in areas of the bone and is detected by a special camera. Healthy bone appears lighter to the camera, and areas of injury, such as those caused by cancer, stand out on the image. PET scans (see above) have been replacing bone scans to find NSCLC that has spread to the bones. Biopsy. A biopsy is the removal of a small amount of tissue for examination under a microscope. It is helpful to have a larger tumor sample to determine the subtype of NSCLC and do additional molecular testing (see below). If not enough of the tumor is removed to do these tests, another biopsy may be needed. After the biopsy, a pathologist analyzes the sample(s). A pathologist is a doctor who specializes in interpreting laboratory tests and evaluating cells, tissues, and organs to diagnose disease. Your doctor may recommend running laboratory tests on a tumor sample to identify specific genes, proteins, and other factors unique to the tumor. There are several genes that may be changed, called mutations, in a lung tumor that can help the cancer grow and spread. These mutations are found in the tumor, and not in healthy cells in the body. This means that they are not inherited or passed down to your children. Mutations that are known to contribute to lung cancer growth often occur on 1 or more of several genes, including EGFR, ALK, KRAS, BRAF, HER2, ROS1, RET, MET, and TRK. Testing the tumor for some of these genes is now common for later-stage NSCLC. Testing for these genes may also be done for earlier stages of the disease. Results from these molecular tests can help determine whether your treatment options include a type of treatment called targeted therapy, which can be directed at specific mutations (see Types of Treatment). Mutations for which targeted therapies exist are much more likely to occur in patients with the adenocarcinoma type of NSCLC and in patients who never smoked. If you have later-stage NSCLC, your doctor may also recommend PD-L1 testing. PD-L1 is found on the surface of cancer cells and some of the body's immune cells. This protein stops the body’s immune cells from destroying the cancer. Knowing if the tumor has PD-L1 helps your doctor decide whether your treatment options include certain types of immunotherapy (see Types of Treatment). These types of immunotherapy block PD-L1 and allow the immune system to target the cancer. For most patients, a diagnosis of NSCLC is extremely stressful. Some patients develop anxiety and, less commonly, depression. Patients and their families should not be afraid to talk with the health care team about how they feel. The health care team has special training and experience that can make things easier for patients and their families and is there to help. In addition to information and emotional support, your doctor may prescribe anti-anxiety medication and occasionally, an antidepressant. Your doctor may also refer you to a counselor, psychologist, social worker, or psychiatrist. You and your family may also find resources available in the community to help people living with lung cancer, such as support groups. Some patients feel comfortable discussing their disease and experiences throughout treatment with their health care team, family, friends, or other patients through a support group. These patients may also join a support group or advocacy group in order to increase awareness about lung cancer and to help fellow patients who are living with this disease. A NSCLC diagnosis is serious. However, your doctor can offer effective treatment for the cancer. In addition, advances being made in the diagnosis and treatment of NSCLC that provide more and more patients with a chance for cure. Even after NSCLC is diagnosed, it is still beneficial to quit smoking. People who stop smoking have an easier time with all treatments, feel better, live longer, and have a lower risk of developing a second lung cancer or other health problems. Stopping smoking is never easy and even harder when facing the diagnosis of NSCLC. If you smoke, seek help from family, friends, programs for quitting smoking, and health care professionals. None of the products available to quit smoking interfere with cancer treatment. Learn more about stopping tobacco use after a cancer diagnosis. ON THIS PAGE: You will learn about the different types of treatments doctors use for people with NSCLC. Use the menu to see other pages. This section explains the types of treatments that are the standard of care for NSCLC. “Standard of care” means the best treatments known. When making treatment plan decisions, you are encouraged to consider clinical trials as an option. A clinical trial is a research study that tests a new approach to treatment. Doctors want to learn whether the new treatment is safe, effective, and possibly better than the standard treatment. Clinical trials can test a new drug, a new combination of standard treatments, or new doses of standard drugs or other treatments. Clinical trials are an option to consider for treatment and care for all stages of cancer. Your doctor can help you consider all your treatment options. Learn more about clinical trials in the About Clinical Trials and Latest Research sections of this guide. Your doctors should have a coordinated plan of care and work effectively with one another. If you do not feel that the health care team is communicating effectively with you or each other about the goals of treatment and the plan of care, talk with your doctors or seek additional medical opinions before treatment. Descriptions of the common types of treatments used for NSCLC are listed below, followed by an outline of the common treatment plans by stage. Your care plan also includes treatment for symptoms and side effects, an important part of cancer care. Treatment options and recommendations depend on several factors, including the type and stage of cancer, possible side effects, and the patient’s preferences and overall health. Take time to learn about all of your treatment options and be sure to ask questions about things that are unclear. Talk with your doctor about the goals of each treatment and what you can expect while receiving the treatment. These types of talks are called “shared decision making.” Shared decision making is when you and your doctors work together to choose treatments that fit the goals of your care. Shared decision making is particularly important for NSCLC because there are different treatment options. Learn more about making treatment decisions. A surgical oncologist is a doctor who specializes in treating cancer using surgery. A thoracic surgeon is specially trained to perform lung cancer surgery. The goal of surgery is to completely remove the lung tumor and the nearby lymph nodes in the chest. The tumor must be removed with a surrounding border or margin of healthy lung tissue. A “negative margin” means that when the pathologist examined the lung or a piece of lung that was removed by the surgeon, no cancer was found in the healthy tissue surrounding the tumor. Lobectomy. The lungs have 5 lobes, 3 in the right lung and 2 in the left lung. A lobectomy is the removal of an entire lobe of the lung. 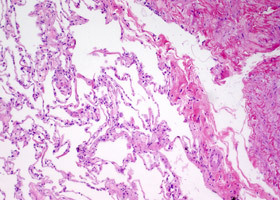 It is currently thought to be the most effective type of surgery, even when the lung tumor is very small. The time it takes to recover from lung surgery depends on how much of the lung is removed and the health of the patient before surgery. Before surgery, talk with your health care team about the possible side effects from the specific surgery you will have. Learn more about the basics of cancer surgery. “Adjuvant therapy” is treatment that is given after surgery. It is intended to get rid of any lung cancer cells that may still be in the body after surgery. This helps lower the risk of recurrence, though there is always some risk that the cancer will come back. The types of adjuvant therapy used for NSCLC include radiation therapy and systemic therapies, such as chemotherapy, targeted therapy, and immunotherapy. Each therapy is described below. Radiation therapy is the use of high energy x-rays or other particles to destroy cancer cells. If you need radiation therapy, you will see a specialist called a radiation oncologist. A radiation oncologist is the doctor who specializes in giving radiation therapy to treat cancer. The most common type of radiation treatment is called external-beam radiation therapy, which is radiation given from a machine outside the body. A radiation therapy regimen, or schedule, usually consists of a specific number of treatments given over a set period of time. This can vary from just a few days of treatment to several weeks. Like surgery, radiation therapy cannot be used to treat widespread cancer. Radiation therapy only destroys cancer cells directly in the path of the radiation beam. It also damages the healthy cells in its path. For this reason, it cannot be used to treat large areas of the body. Sometimes, CT scans (see Diagnosis) are used to plan out exactly where to direct the radiation to lower the risk of damaging healthy parts of the body. This is called intensity modulated radiation therapy (IMRT) or stereotactic body radiation therapy (SBRT). It is not an option for all patients, but it may be used for patients with early-stage disease and small tumors when surgery is not an option. Listen to a Cancer.Net Podcast on ASCO’s recommendations for radiation therapy for NSCLC. People with lung cancer who receive radiation therapy often experience fatigue and loss of appetite. If radiation therapy is given to the neck or center of the chest, side effects can include a sore throat and difficulty swallowing. Patients may also notice skin irritation, similar to sunburn, where the radiation therapy was directed. Most side effects go away soon after treatment is finished. If the radiation therapy irritates or inflames the lung, patients may develop a cough, fever, or shortness of breath months and sometimes years after the radiation therapy ends. About 15% of patients develop this condition, called radiation pneumonitis. If it is mild, radiation pneumonitis does not need treatment and goes away on its own. If it is severe, a patient may need treatment for radiation pneumonitis with steroid medications, such as prednisone (Rayos). Radiation therapy may also cause permanent scarring of the lung tissue near where the original tumor was located. The scarring does not usually cause symptoms. However, severe scarring can cause a permanent cough and shortness of breath. For this reason, radiation oncologists carefully plan the treatments using CT scans of the chest to lessen the amount of healthy lung tissue exposed to radiation (see above). Chemotherapy is the use of drugs to destroy cancer cells, usually by keeping the cancer cells from growing, dividing, and making more cells. It has been shown to improve both the length and quality of life for people with lung cancer of all stages. A chemotherapy regimen, or schedule, usually consists of a specific number of cycles given over a set period of time. The type of lung cancer you have, such as adenocarcinoma or squamous cell carcinoma, affects which drugs are used for chemotherapy. Chemotherapy may also damage healthy cells in the body, including blood cells, skin cells, and nerve cells. The side effects of chemotherapy depend on the individual and the dose used, but they can include fatigue, low numbers of blood cells, risk of infection, mouth sores, nausea and vomiting, loss of appetite, diarrhea, numbness and tingling in the hands and feet, and hair loss. Your medical oncologist can often prescribe drugs to help relieve many of these side effects. Hormone injections are used to prevent white and red blood cell counts from becoming too low. Nausea and vomiting are also often avoidable. Learn more about preventing nausea and vomiting caused by cancer treatment. These side effects usually go away after treatment is finished. Not all tumors have the same targets. To find the most effective treatment, your doctor may run tests to identify the genes, proteins, and other factors in the tumor. For some lung cancers, abnormal proteins are found in unusually large amounts in the cancer cells. This helps doctors better match each patient with the most effective treatment whenever possible. In addition, research studies continue to find out more about specific molecular targets and new treatments directed at them. Learn more about the basics of targeted treatments. Bevacizumab (Avastin, Mvasi) is an anti-angiogenic drug given along with chemotherapy for lung cancer. It may also be used along with chemotherapy and the immunotherapy drug tezolizumab (Tecentriq; see below) for metastatic NSCLC. The risk of serious bleeding for patients taking bevacizumab is about 2%. However, it is more common for patients with squamous cell carcinoma, so bevacizumab is not recommended for patients with this type of NSCLC. Ramucirumab (Cyramza) is approved for NSCLC along with the chemotherapy drug docetaxel. Epidermal growth factor receptor (EGFR) inhibitors. Researchers have found that drugs that block EGFR may be effective for stopping or slowing the growth of lung cancer. Afatinib (Gilotrif) is an initial treatment option for NSCLC. It may also be an option for patients who have already received other treatments for squamous NSCLC. It is a type of drug called a tyrosine kinase inhibitor (TKI). Dacomitinib (Vizimpro) is approved as an initial treatment for NSCLC that has an EGFR mutation. However, it is not frequently used. 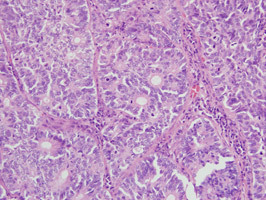 Erlotinib (Tarceva) has been shown to work better than chemotherapy if the lung cancer has a mutation in the EGFR gene. It is an option for patients with locally advanced and metastatic NSCLC. It may also be used as a maintenance therapy for patients with NSCLC that has not grown or spread after at least 4 cycles of chemotherapy. This medication is a pill that can be taken by mouth. The side effects of erlotinib include a rash that looks like acne, and diarrhea. Gefitinib (Iressa) is another option that was only available in Europe and Asia but now is also available in the United States. Necitumumab (Portrazza) may be an option along with chemotherapy for squamous cell lung cancer. However, this drug is not commonly used. Osimertinib (Tagrisso) is a first treatment option for some people with NSCLC whose tumors have EGFR mutations. Osimertinib is also approved for the treatment of metastatic NSCLC with an EGFR mutation when other drugs listed above no longer work. Anaplastic lymphoma kinase (ALK) inhibitors. Mutations in the ALK gene are found in about 5% of patients with NSCLC. Drugs that target changes in a gene called ROS1. A specific genetic change called an NTRK fusion. This type of genetic change is found in a range of cancers, including lung cancer. For most patients with advanced NSCLC that cannot be treated with a targeted therapy (see above), immunotherapy or immunotherapy plus chemotherapy is often the preferred initial treatment. Different types of immunotherapy can cause different side effects. Common side effects include skin reactions, flu-like symptoms, diarrhea, and weight changes. Talk with your doctor about possible side effects for the immunotherapy recommended for you. A surgeon can place a stent to prop open an airway or use a laser to burn away a tumor. Medications can be used to stop a cough, open closed airways, or reduce bronchial secretions. Prednisone or methylprednisolone (A-Methapred, Depo-Medrol, Medrol, Solu-Medrol) can reduce inflammation caused by lung cancer or radiation therapy and improve breathing. In general, stage I and stage II NSCLC are treated with surgery. Surgeons cure many people with an operation. Before or after surgery, a patient may also meet with a medical oncologist. Some patients with large tumors or signs that the tumor has spread to the lymph nodes may benefit from chemotherapy. Chemotherapy may be given before the surgery, called neoadjuvant chemotherapy or induction chemotherapy. Chemotherapy may also be given after surgery, called adjuvant chemotherapy, to reduce the chance that the cancer will return. Adjuvant chemotherapy with cisplatin is not recommended for patients with stage IA NSCLC that was completely removed with surgery. Patients with stage IB lung cancers should talk with their doctors about whether chemotherapy is right for them after surgery. Adjuvant cisplatin-based chemotherapy is recommended for patients with stage II NSCLC that has been completely removed with surgery. Patients with stage II NSCLC should talk with their doctor about whether this treatment is right for them. In general, people with stage III NSCLC receive 3 different types of treatment. A combination of chemotherapy and radiation therapy followed by immunotherapy is usually recommended for NSCLC that cannot be removed with surgery. Chemotherapy and radiation therapy may be given together, which is called concurrent chemoradiotherapy. Or, they may be given one after the other, called sequential chemoradiotherapy. Adjuvant cisplatin-based chemotherapy is recommended for people with stage IIIA lung cancers that have been completely removed with surgery. Patients should talk with their doctor about the best treatment options for them. Patients with stage IV NSCLC typically do not receive surgery or radiation therapy as the main treatment. Occasionally, doctors may recommend surgery for a metastasis in the brain or adrenal gland if that is the only place the cancer has spread. People with stage IV disease have a very high risk of the cancer spreading or growing in another location. Most patients with this stage of NSCLC receive systemic therapies, such as chemotherapy, targeted therapy, or immunotherapy. Palliative care will also be important to help relieve symptoms and side effects. The goals of systemic therapies are to shrink the cancer, relieve discomfort caused by the cancer, prevent the cancer from spreading further, and lengthen a patient’s life. These treatments can occasionally make metastatic lung cancer disappear. However, doctors know from experience that the cancer will usually return. Therefore, patients with stage IV disease are never considered “cured” of their cancer no matter how well treatment works. Treatment often continues as long as it is controlling the cancer’s growth. Systemic therapy and palliative care have been proven to improve both length and quality of life for patients with stage IV NSCLC. If the cancer worsens or causes too many severe side effects, the treatment may be stopped. Patients would continue to receive palliative care and may be offered treatment in a clinical trial. The first drug or combination of drugs a patient takes is called “first-line” treatment, which may be followed by “second-line” and “third-line” treatment. No specific treatment or combination of treatments works for every patient. If the first-line treatment causes too many or dangerous side effects, does not appear to be working, or stops working, the doctor may recommend a change in treatment. ASCO’s recommendations for systemic therapies for NSCLC are included below. All patients should also receive palliative care. First-line treatment. First-line systemic therapy for NSCLC often depends on the genetic changes found in the tumor. Immunotherapy or immunotherapy plus chemotherapy for patients with tumors that have a high level of the PD-L1 protein. Chemotherapy with a combination of drugs for people with tumors that do not have high levels of PD-L1. 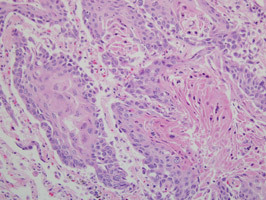 This may include bevacizumab for patients with non-squamous cell carcinoma who are receiving carboplatin and paclitaxel. Immunotherapy may also be added to chemotherapy with carboplatin and pemetrexed for patients with non-squamous cell carcinoma. For patients with tumors that have a genetic change on the ALK gene, targeted therapy options are alectinib, brigatinib, ceritinib, or crizotinib. For patients with tumors that have a genetic change on the ROS1 gene, crizotinib is an option. Second-line treatment. Second-line treatment for NSCLC depends on the gene mutations found in the tumor and the treatments patients have already received. Nivolumab, pembrolizumab, or atezolizumab if they have a high level of PD-L1, received chemotherapy for first-line treatment, and have not received immunotherapy. Nivolumab, atezolizumab, or chemotherapy if they have a low or unknown level of PD-L1 and have already received chemotherapy. Chemotherapy for patients who have already received immunotherapy. Docetaxel or docetaxel plus ramucirumab for patients who had severe side effects from immunotherapy. Pemetrexed for patients with non-squamous cell carcinoma who did not receive it during first-line treatment. Third-line treatment. Third-line treatment for NSCLC is usually chemotherapy with pemetrexed or docetaxel. Chemotherapy is often not as effective as radiation therapy or surgery to treat NSCLC that has spread to the brain. For this reason, NSCLC that has spread to the brain is usually treated with radiation therapy, surgery, or both. This can cause side effects such as hair loss, fatigue, and redness of the scalp. With a small tumor, a type of radiation therapy called stereotactic radiosurgery can focus the radiation only on the tumor in the brain and lessen the side effects. Newer targeted therapies, such as osimertinib and alectinib, have shown that they can work well to treat brain metastases. In addition, immunotherapy may also be an option. This may allow many patients to have a systemic therapy for brain metastases and avoid the side effects that come from chemotherapy and radiation therapy to the brain. As described above, palliative care will also be important to help relieve symptoms and side effects. Radiation therapy or surgery may also be used to treat metastases that are causing pain or other symptoms. Bone metastases that weaken major bones can be treated with surgery, and the bones can be reinforced using metal implants. If the cancer returns after the original treatment, it is called recurrent cancer. It may come back in the same place (called a local recurrence), nearby (regional recurrence), or in another place (distant recurrence). Most often, when there is recurrence, it is stage IV disease. When this is a recurrence, a new cycle of testing will begin again to learn as much as possible about the recurrence. After this testing is done, you and your doctor will talk about the treatment options. Often the treatment plan will include the treatments described above such as surgery, chemotherapy, and radiation therapy, but they may be used in a different combination or given at a different pace. Your doctor may suggest clinical trials that are studying new ways to treat this type of recurrent cancer. Whichever treatment plan you choose, palliative care will be important for relieving symptoms and side effects. Doctors and scientists are always looking for better ways to care for people with NSCLC. To make scientific advances, doctors create research studies involving volunteers, called clinical trials. In fact, every drug that is now approved by the FDA was tested in clinical trials. Doctors generally do clinical research in distinct phases that have different goals. Learn more about the phases of clinical trials. Clinical trials are used for all types and stages of NSCLC. Many focus on new treatments to learn if a new treatment is safe, effective, and possibly better than the existing treatments. These studies evaluate new drugs and methods of treatment, new approaches to treatment, and new prevention methods. People decide to participate in clinical trials for many reasons. For some people, a clinical trial is the best treatment option available. Because standard treatments are not perfect, people are willing to face the added uncertainty of a clinical trial in the hope of a better result. Other people volunteer for clinical trials because they know that these studies are a way to contribute to the progress in treating NSCLC. Even if they do not benefit directly from the clinical trial, their participation may benefit future patients with NSCLC. The next section in this guide is Latest Research. It explains areas of scientific research for NSCLC. Use the menu to choose a different section to read in this guide. Common physical side effects from each treatment option for NSCLC are listed in the Types of Treatment section. Learn more about side effects of cancer and its treatment, along with ways to prevent or control them. Changes to your physical health depend on several factors, including the cancer’s stage, the length and dose of treatment, and your general health. You may find it helpful to keep track of your side effects so it is easier to explain any changes to your health care team. Learn more about why tracking side effects is helpful. Family members and friends often play an important role in taking care of a person with NSCLC. This is called being a caregiver. Caregivers can provide physical, practical, and emotional support to the patient, even if they live far away. Although the main focus of caregivers is usually the person they are caring for, it is also important for caregivers to seek support. Such support may be available through family, friends, support groups specific for caregivers, or professional counselors. Learn more about caregiving. One goal of follow-up care is to check for a recurrence, which means that the cancer has come back. Cancer recurs because small areas of cancer cells may remain undetected in the body. Over time, these cells may increase in number until they show up on test results or cause signs or symptoms. During follow-up care, a doctor familiar with your medical history can give you personalized information about your risk of recurrence. Some people may have blood tests or imaging tests done as part of regular follow-up care, but testing recommendations depend on several factors including the type and stage of cancer originally diagnosed and the types of treatment given. People who develop NSCLC are at higher risk for developing a second lung cancer. Your doctor will recommend having future scans to watch for a recurrence so any new cancer can be found as early as possible. Common post-treatment problems include pain, fatigue, and shortness of breath. Your doctor, nurse, and social worker can help you develop a plan to manage any problems that persist after treatment. Survivors of NSCLC who have smoked cigarettes in the past also have a high risk of heart disease, stroke, emphysema, and chronic bronchitis. Certain cancer treatments can further increase these risks. Even for those who don’t smoke, healthy lifestyle choices after cancer are important for overall well-being. However, as treatment is completed, the caregiver's role often changes. Caregivers may also view the transition into survivorship differently than the patient, especially if they are not actively involved in ongoing follow-up care. Eventually, the need for caregiving related to the cancer diagnosis will become much less or come to an end. Caregivers can learn more about adjusting to life after caregiving. Nothing helps recovery more than stopping smoking. There are many tools and approaches available. Be sure to get help from your family, friends, nurses, and doctors because it is difficult to stop on your own. People recovering from lung cancer are encouraged to follow established guidelines for good health, such as not smoking, limiting alcohol, eating well, and managing stress. Regular physical activity can help rebuild your strength and energy level. Recovering patients, even those using oxygen, are encouraged to walk for 15 to 30 minutes each day to improve their heart and lung functioning. Your health care team can help you create an appropriate exercise plan based on your needs, physical abilities, and fitness level. Learn more about making healthy lifestyle choices. What mutations does the tumor have? What does this mean? Do my family members have a higher risk of NSCLC? What online resources do you recommend to learn more? Will I be able to go to and return from this treatment on my own, or should I find someone to help me? What will these medications cost me? Are there less expensive options that work as well? How much of the healthy lung will also receive radiation? Is it possible for me to receive chemotherapy with my radiation therapy? If so, what are the added side effects of giving the chemotherapy at the same time, compared with 1 after another? How much will this treatment cost me? Are there other options that are equally effective and possibly less expensive? How will my experience differ if I enroll in this clinical trial, compared with standard treatment? For example, are there different risks, extra tests, a different time commitment, schedule, or costs? What costs will I have to pay if I join this trial? What costs will be covered by my insurance or the clinical trial? Who should I contact about any late or long-term side effects I experience? And how soon? What are the benefits of me quitting smoking, even after a cancer diagnosis? ON THIS PAGE: You will find some helpful links to other areas of Cancer.Net that provide information about cancer care and treatment. This is the final page of Cancer.Net’s Guide to Non-Small Cell Lung Cancer. Use the menu to go back and see other pages. Search for a lung cancer specialist in your local area using this free database of doctors from the American Society of Clinical Oncology. For more information about treatment options for this disease, see the following topic review from UpToDate: Patient information: Non-small cell lung cancer treatment; stage I to III cancer (Beyond the Basics). Please note that this link takes you to a separate, independent website. This is the end of Cancer.Net’s Guide to Non-Small Cell Lung Cancer. Use the menu to choose a different section to read in this guide.